FILE - A medic inspects the damage inside Anadan Hospital, sponsored by Union of Medical Care and Relief Organizations, after it was hit by an airstrike in the rebel-held city of Anadan, northern Aleppo province, Syria, July 31, 2016. A group of doctors in the battered northern Syrian city of Aleppo sent a letter to U.S. President Barack Obama describing the devastation there and pleading for action to stop sieges and attacks against civilians. Aleppo was Syria's second-largest city when civil war broke out in the county five years ago and remains caught in the battle for control between rebels and pro-government forces. The fighting has included numerous attacks on medical facilities, which the doctors wrote will wipe out medical services in Aleppo in a month if they continue at the same rate. "What pains us most, as doctors, is choosing who will live and who will die. Young children are sometimes brought into our emergency rooms so badly injured that we have to prioritize those with better chances, or simply don't have the equipment to help them." 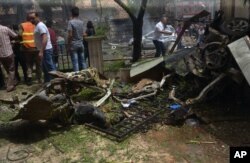 FILE - In this photo released by the Syrian official news agency SANA, Syrian citizens and firefighters gather where a rocket hit the Dubeet hospital in the central neighborhood of Muhafaza in Aleppo, Syria, May 3, 2016. In Washington, State Department spokeswoman Elizabeth Trudeau said attacks against civilians must stop. "The United States has repeatedly condemned indiscriminate bombing of medical facilities by the Assad regime in Aleppo and elsewhere in Syria. The attacks, I think, as illustrated in this letter are appalling. They must cease," Trudeau said Thursday during the daily briefing. Sieges in Aleppo left many people in need of food and medical aid. The United Nations has tried coordinated deliveries, but has been hindered by ongoing violence. The U.S. is working with the U.N. and others, including Russia, to "find a diplomatic approach to reduce the violence in a sustainable way, and allow unimpeded lifesaving humanitarian access into places like Aleppo," according to Trudeau. While commending Russia's willingness to consider a three-hour pause of military action in Aleppo, the U.S. supports the U.N.'s call for a long-term cease-fire. "Any pause is good, anything that cuts the violence," said Trudeau, adding "the U.N. has come out and they've said that the three hours are not enough" and Washington supports the U.N. on this. Attempts at U.N.-led peace talks, which included efforts by the United States and Russia to coordinate Syria's warring sides, have also been unsuccessful. "For five years, we have face death from above on a daily basis. But now we face death from all around," the doctors wrote. "For five years, the world has stood by and remarked how 'complicated' Syria is, while doing little to protect us." The doctors said they do not need tears, sympathy or prayers, but to be free from bombings and international action to prevent any future sieges.